U.S. President Donald Trump’s straight-talking political style and deal-making ability have won him a legion of new admirers in China. 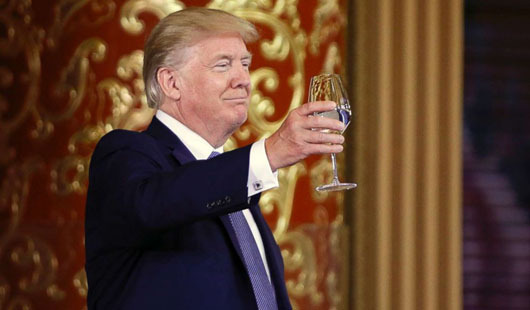 U.S. President Donald Trump toasts at a state dinner at the Great Hall of the People in Beijing. The Chinese see Trump’s granddaughter learning Mandarin and the American president’s treatment of his Chinese counterpart Xi as acknowledging their culture, something they say they didn’t get from former President Barack Obama. Most Chinese see Trump as more receptive, less preachy, and not trying to dictate to China. Calling him “Uncle,” a respected honorific in China, is a big deal, analysts say, adding that it indicates someone who is both owed respect and whose word is important to regard. Some opinions of the American president were reserved on a conditional basis.